How to manage user roles and permissions? How to invite users to my Kanbanize account? How to work with the User Managment tab? How to assign users to a board? 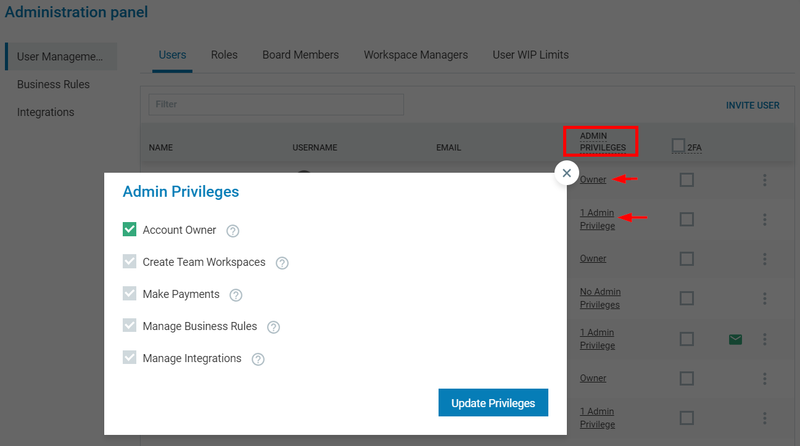 Admin Privileges are a system level of permissions that allow users to access and manage different areas of Administration Panel and product modules. Users with Account Owner privileges have all of the Administration Privileges enabled. Allows users to create and manage new Team Workspaces. That includes the permissions to create and manage Card Templates, Custom Fields and Tokens on the Workspace level. Allows users to work with Business Rules automation engine. That includes the permissions to create, modify and delete Business Rules on all boards where the user is an assignee. Allows users to enable/disable and manage all integrations in the account. That includes the right to manage the Email Integration and Board Webhooks. How to Manage Custom Fields directly from the Board?